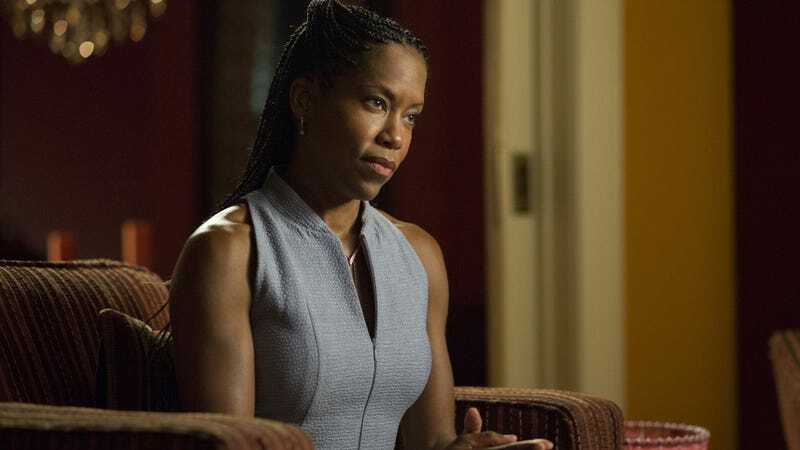 Regina King, seen here on The Leftovers, will play the main character in Watchmen. While we don’t know for sure which characters any of them are playing, the first cast members of HBO’s upcoming Watchmen pilot have been revealed. And they’re pretty fantastic. Variety reports Regina King will play the lead character in the series, and she’ll be joined by Don Johnson, Tim Blake Nelson, Louis Gossett Jr., Adelaide Clemens, and Andrew Howard. Deadline adds that “King is believed to be playing Angela Abraham, while Gossett Jr. likely is Old Man. Howard is said to be playing Red Scare, Clemens could be Pirate Jenny,” but none of that is confirmed. “But wait,” you’re wondering. Since it’s Watchmen, who is Rorschach, the Comedian, Dr. Manhattan, etc? Well, just yesterday, showrunner Damon Lindelof explained that the HBO series is not a direct adaptation of the iconic Alan Moore and Dave Gibbons series. It’s both a sequel, and not a sequel. A modern retelling, but with familiar characters and situations. So, while the surviving characters from that series could appear in this new series, it’s not that simple. No matter who each of these actors will be playing, though, it’s a very eclectic, interesting cast—and a great start for the sure to be controversial and scrutinized show.